More than 20,000 pork producers and ag professionals from throughout the world attended the 2018 World Pork Expo, June 6-8, in Des Moines, Iowa. Presented by the National Pork Producers Council, Expo celebrated its 30th anniversary by setting numerous records, including its largest trade show, more educational seminars and a barn-busting World Pork Expo Junior National show. The 2019 Expo will take place June 5-7. In search of new ideas and solutions, not just for today but for tomorrow, too, more than 20,000 producers, employees and pork professionals attended the 2018 World Pork Expo, June 6-8. Presented by the National Pork Producers Council, Expo also welcomed nearly 1,000 international guests from 35 countries to Des Moines. Marking its 30th year, the 2018 Expo presented a record number of trade-show exhibitors, hospitality tents, educational seminars and live hogs in the Junior National show. The Iowa State Fairgrounds provided the perfect backdrop for a festive summer evening during MusicFest, giving visitors the opportunity to share fun and fellowship. A long-time highlight, the Big Grill — staffed by Iowa’s Tama County Pork Producers Association — served more than 10,000 free pork lunches over the event’s three days. 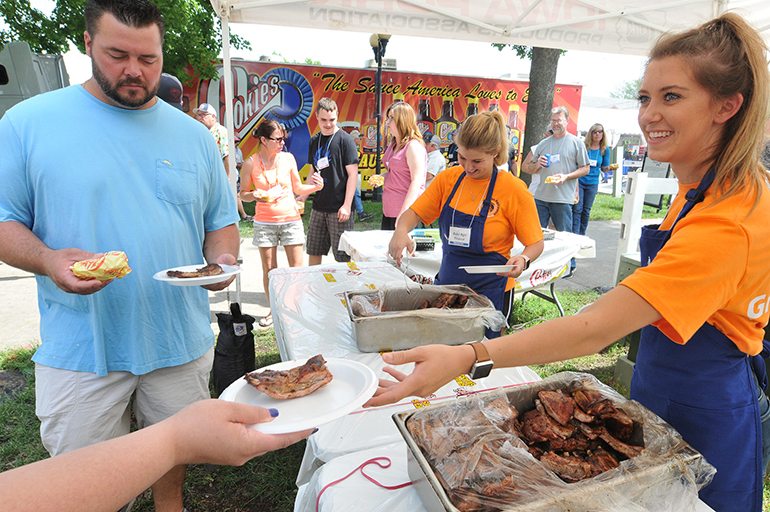 There’s never a shortage of delicious grilled pork on the Iowa State Fairgrounds during World Pork Expo, and the Big Grill is always a highlight. Iowa’s Tama County Pork Producers Association returned to grill and serve more than 10,000 free pork lunches during Expo’s three days. The dates for next year’s Expo are June 5-7, in Des Moines. Topping the list of priorities for Expo attendees was the world’s largest pork-specific trade show, and this year’s offering set a record. The addition of the Jacobson Exhibition Center and an expanded outdoor exhibit space pushed the trade show beyond 360,000 square feet. A mix of first-time and long-time exhibitors from more than 500 U.S. and international companies displayed the latest products, services and technologies for pork production. A record 60 hospitality tents provided pork producers and their employees an opportunity to meet with allied industry representatives in a relaxed setting. Expo provides an opportunity to meet multiple people within a production company, from managers to finance specialists, over a couple of days, Hermesch points out. A 30-year Expo exhibitor, Provimi provides nutritional services to pork producers. A Danish company, SKOV provides energy-efficient climate control solutions and weighing options for pork production systems. This year marked its second year exhibiting at Expo. With a presence in 87 countries, Knauer particularly likes Expo’s link to international visitors. The World Pork Expo Junior National continued its steady growth this year with 1,450 young swine showmen from 34 states exhibiting more than 2,800 hogs. That’s an increase of 300 hogs from the 2017 show. Beginning on June 4 and running throughout the week, the Junior National is considered to be among the nation’s premier youth swine events. Along with the live-hog show, activities include educational and certification programs, as well as swine judging and showmanship competitions. The vibrant World Pork Expo Junior National show continued its steady growth, with nearly 1,200 youth, representing 32 states. That compares to 1,050 exhibitors from 32 states in 2017. Also breaking records were the number of live hogs exhibited — 2,800 head — an increase of 300 hogs from 2017’s record. To accommodate the ever-expanding show, the events began on June 4, and ran through the end of the week. Hosted by the National Junior Swine Association and Team Purebred, the Junior National combines educational activities such as a Skillathon and Youth PQA Plus certification, with swine judging, live-hog competitions and showmanship. 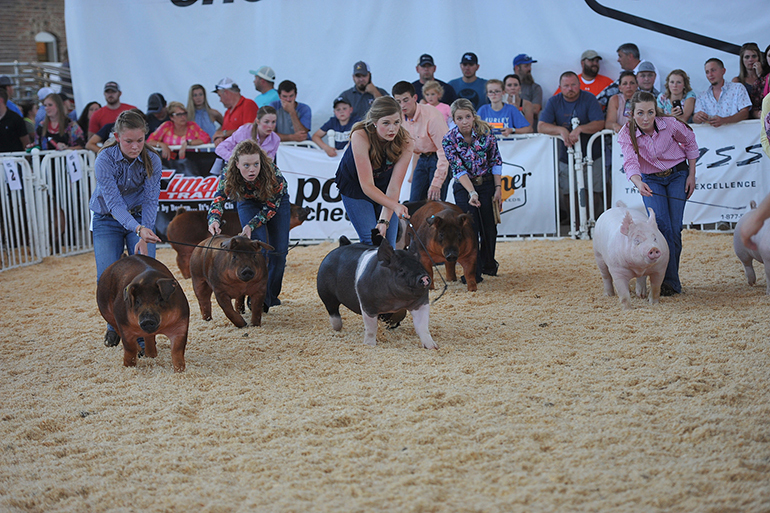 On June 8, the open show featured more than 760 crossbred and purebred boars and gilts. Junior exhibitors were eligible to join other swine breeders for the competition and the opportunity to be selected for the breeding stock sale on the morning of June 9. Results for the open shows and sales for National Swine Registry breeds can be found by clicking here. Pork producers are known for their continuous quest for information and ideas, which made the many educational and business seminars an Expo bonus. This year, pork producers and their employees could select from 20 free seminars. In addition to educational presentations, the sessions provided an opportunity for open dialogue and interaction with the presenters. Presented by allied industry, the business seminar topics ranged from consumer trends to production-data analysis to maximizing vaccination and disease programs to environmental solutions inside and outside the hog barn and more. PORK Academy seminars, presented by Pork Checkoff, addressed such topics as sow longevity and productivity, antibiotic resistance and responsible use, and domestic and international pork marketing strategies. There also was an update on the industry’s Secure Pork Supply Plan, which is designed to address pork producers’ needs in the event that the United States faces a market-limiting foreign animal disease. Market outlook and weather presentations rounded out the educational events and provided information that producers can use for long-term strategic planning. World Pork Expo will move into its 31st year in 2019. So, mark your calendars and plan to attend the 2019 World Pork Expo, June 5-7, at the Iowa State Fairgrounds in Des Moines.